A Shipping Method is one of many ways that goods are transported to your company from your vendors, and from you to your customers. You can use the same Shipping Methods for your vendors and your customers. A Shipping Type indicates whether goods you are buying are delivered by the vendor or picked up by you and whether goods you are selling are delivered by you or picked up by the customer. The Shipping Type is used when calculating taxes. 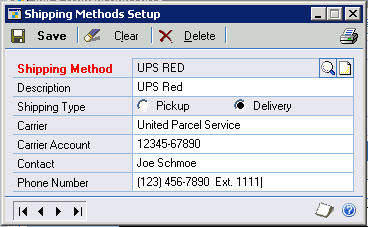 If you’ve marked the 'Use Shipping Method when Selecting Default Tax Schedule' option in the Company Setup Options window, GP uses the Shipping Method assigned to the transaction to determine where the exchange of goods takes place, and provides the appropriate Tax Schedule as the default schedule for the transaction. For instance, if you're selling an item to a customer and the Shipping Method uses a Shipping Type of 'Delivery', the customer's Tax Schedule is used because the exchange of goods takes place at the customer's location. If the Shipping Method uses a Shipping type of 'Pickup', this means the exchange of goods takes place at your location and hence, the tax rates in your locale are applicable. The Shipping Type could be considered equivalent to FOB (Free on Board), which determines where the legal passage of title to the goods takes place.